Hello Gorgeous: Why Is Color So Hard? Why Is Color So Hard? 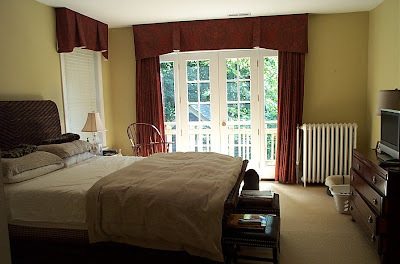 The first thing I did this year was remove the Ralph Lauren pelmet and drapes in my bedroom (compliments of the previous owner) and replace them with linen drapes. I also repainted my bedroom from dingy gold to (oddly) brighter gray. The hall leading to the bedroom is white but up the stairs is that goldish wallpaper so the gray clashes. I want to repaint it this color or sort of a French Gray. Thoughts? Color recommendations? Comments? I have a lot of different shades of gray in my house and i LOVE it. It's realy a color that changes with the seasons and it's never boring. First of all, great job on all the changes you've made. Such an improvement! Second, I have Revere Pewter in my bedroom and I still love it (and I have tons of gold accents, as you can imagine), but I know it looks different in different lighting/living conditions. So, I would suggest trying the BM Color Viewer online and flipping through the grays. I've heard lots of good things about Bunny Gray as a cooler but still neutral gray. Or maybe Nimbus Gray? You know what makes the gray in that photo sao incredible? It's the matte-est of mattes and rubbed on with a cloth. That's how you fake a plaster finish on drywall. Erin: What light do you get in your br? North? South? PillowMint: I got the Dior Gray sample. It looks really dark but beautiful. Does your shop have a lot of light? I came to see and couldn't find it. Raina: In real life, the photo definitely has some gloss. Does it look gray or blue to you? if you go to my store website (pillowmint.net) click on the "about us" tab. the second picture has a good shot of the wall. actually the store doesn't have very good light - the gray just works! good luck! In the sitting room I think the white shelf above the black tile of the fireplace should be removed and just have drywall down to the fireplace....much more contemporary. More visually appealing? Then two black or dark floor lamps on each side of the sofa with a very intersting and sturdy "something" for a coffee table. The lamps would balance the dark color of the fireplace and the coffee table will give it all some punch. What do you think? I'm loving the changes to your bedroom and I always love gray in any room. I don't really see your issue, but sometimes pictures don't translate color the way it is in real life. I agree with Erin and check out the color viewer. Thanks, anon, but the shelf stays. The tiles are brown, original to the house and the house is 110 y/o. I'm not really looking for it to be contemporary, just not fusty. Thanks, Jess. It's a dreary day here so it looks drearier than usual, too. There's something not quite right, though. P.S. To anon, I would really replace both fireplaces with something more to my liking but my husband, Mahogany Man, would keel over. In fact, he liked it the old way. We painted our entire house practically in Ralph Lauren "Polaris" gray. I absolutely loved it. It was the perfect neutral. Now we're in a new house with tan "burnt cashew" colored walls and I am not loving it. Itching to paint it something else but gray won't work here. Vast improvement, nice job! I love grey in a home, it is undstated and calming. I recently painted our dining room RL Brompton Grey, love it. Revere Pewter is a greeny gray but it usually reads just like a neutral gray. How about smoky taupe 983? It's a fabulous warm taupy gray colour. I do like the room now though, it looks very modern with the new drapery. At least Mahogany Man allowed for the painting of the shelf, or didn't insist on having it stripped off. Mine is always keening about "don't paint wood, you never paint woooooooood." Not that I listen, much. I really like the changes you've made so far and loooove that zebra rug. Holy moley, the after is so much better! Looks great. As for color... I'm much too lazy to voluntarily repaint, but if you're not, I bet that grey color would look awesome. I am off today to get all the recommended swatches. Thanks, everyone. E: We should start a blog, The Serial Repainters Club. sometimes it just takes awhile to get it right. Lolo: You should have seen our other house with wood ranch-style kitchen cabinets. I will post a before and after sometime. It took me 3 years to convince him to let me paint them. Actually, I painted the living room, including all the paneling and moldings in Revere Pewter when we first moved here and it appeared taupier in that room. Everybody hated it except me. I should have stood my ground. I found a grey I love -- Ralph Lauren Boulder Grey. Not a pretty name, but a wonderful color... very 'dry' grey & NO GREEN. Using it in my kitchen, w/ slate tile floors, white woodwork & carrera countertops. Great job on your improvements! I find that the grays I like are not as blue. I love blue, too, but if it's not fairly dark (and not bright) it seems cold to me. Please report back with your findings after you get those chips/samples. I want Dior gray just for the name. Well, it looks like you've gone to the paint store already. If you happen to pass a Sherwin Williams, grab a chip of Modern Gray. I've been planning for painting in case a miracle occurs here and so far it's my favorite. Actually in the pictures, I really like the gray you have, but maybe it's just my monitor. HG, My bedroom faces Northeast, so all grays tend to go cool in there. Actually, I think because I have really warm oak floors, grays tend to read bluer all over my house. I read somewhere that gray appears as complimentary to whatever color it's up against. So, if I had blue floors, the gray would probably appear much warmer, if that makes sense. The BM color viewer isn't perfect by any means, but it helps to see which way a shade will skew and it's usually pretty accurate in terms of density. And I just finished repainting the nursery... again. I'm ready to start up the serial repainter's club whenever you are! Ok, what about Gray Timber Wolf or Sweet Innocence? Much, much cooler, but look similar to your pick. Wickham Gray and Stonington Gray are also nice, but a little warmer. Karly has Harbor Gray and it's a very true gray. E. - You are awesome! I think I just need to start mixing my own paint. Btw, did you post any pictures of the painted nursery? Am I just forgetful? Despite that you don't love the gray the transformation is wonderful. Such a nice change. Don't get discouraged. You'll find a great color. I'm sitting next to a table of about 25 paint chips as I type this. Part of me wants to just close my eyes and grab one and go with it. I love dark paint! If you do find a color you love, BM should be able to mix it darker for you. Just ask. I want to joing the serial repainter's club too! I'm just so glad I'm not alone, because my husband thinks I'm crazy for wanting to repaint anything. He's much like mahogany man - doesn't want to paint wood surfaces, and wondered what was wrong with the white (bad) paint job inside our house when we moved in! I'm wanting to go more neutral in my living room, and am planning a guerilla painting job the next time hubby's out of town on business. I know it sounds mean, but I don't want to deal with all the "Why"'s and complaints. I figure if it's done when he gets back, there's not much he can do about it!! Plus, I know he'll like it. Rachel, if he's anything like my husband he won't even notice for 3 years. Don't be a douchebag, anon. Gray is a nice color for interior. It's soothing and really relaxing. Great job! Why do I see purple undertones with BM Revere Pewter. I do not see green at all. Am I color blind? I usually am really good with colors. It Pays to Recycle. Literally. I Owe Gwyneth Paltrow An Apology. Did You Watch Grey Gardens? The Real HG, 60's Style.